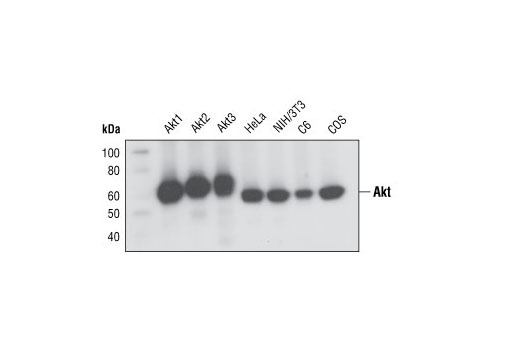 Western blot analysis of recombinant Akt1, Akt2 and Akt3 proteins, and extracts from various cell lines, using Akt (pan) (C67E7) Rabbit mAb. 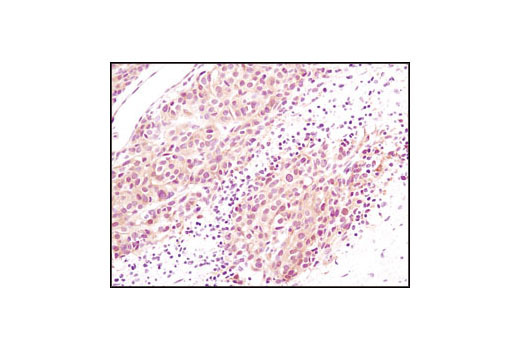 Immunohistochemical analysis of paraffin-embedded human melanoma using Akt (pan) (C67E7) Rabbit mAb. 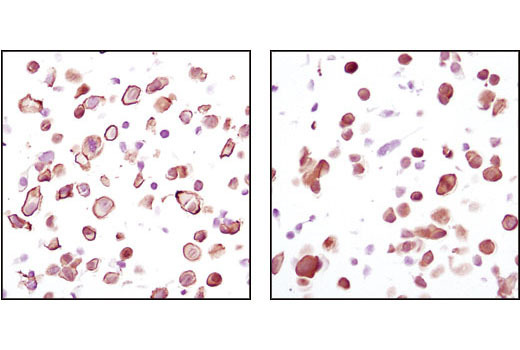 Immunohistochemical analysis of paraffin-embedded human breast carcinoma using Akt (pan) (C67E7) Rabbit mAb in the presence of control peptide (left) or Akt (pan) Blocking Peptide #1085 (right). 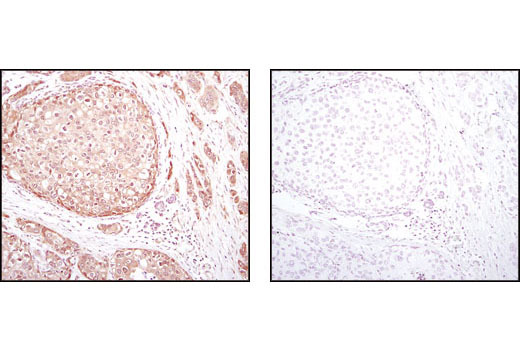 Immunohistochemical analysis using Akt (pan) (C67E7) Rabbit mAb on SignalSlide (TM) Phospho-Akt (Ser473) IHC Controls #8101 (paraffin-embedded LNCaP cells, untreated (left) or LY294002-treated (right)). 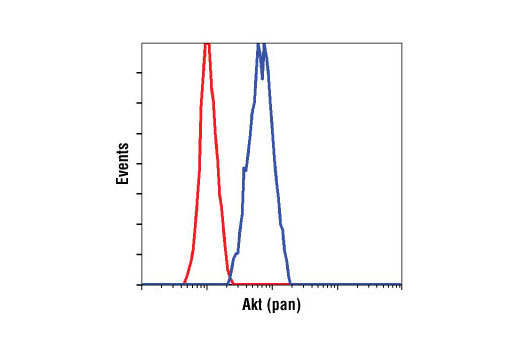 Flow cytometric analysis of Jurkat cells using Akt (pan) (C67E7) Rabbit mAb (blue) compared to a nonspecific negative control antibody (red). 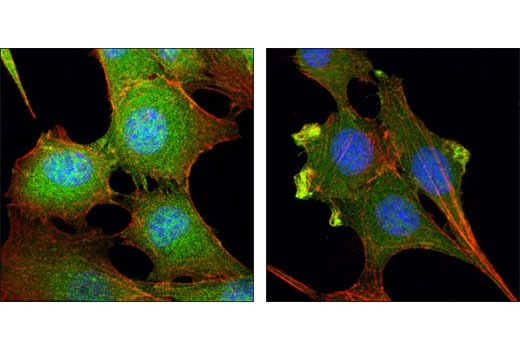 Confocal immunofluorescent analysis of C2C12 cells, LY294002-treated (left) or insulin-treated (right), using Akt (pan) (C67E7) Rabbit mAb (green). Actin filaments have been labeled with Alexa Fluor® 555 phalloidin (red). Blue pseudocolor = DRAQ5™ (fluorescent DNA dye). 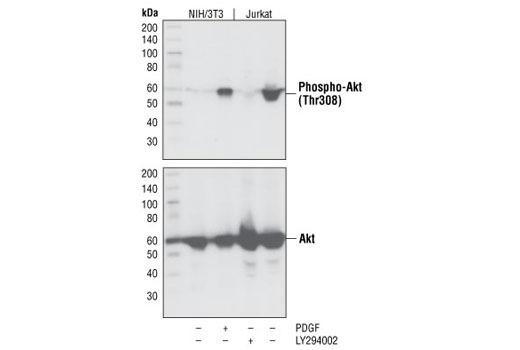 PhosphoPlus® Duets from Cell Signaling Technology (CST) provide a means to assess protein activation status. Each Duet contains an activation-state and total protein antibody to your target of interest. These antibodies have been selected from CST's product offering based upon superior performance in specified applications. Wu, C. et al. (2016) Mol Cell Biol 36, 1555-68. Hinson, J.T. et al. (2016) Cell Rep 17, 3292-3304. PhosphoPlus is a trademark of Cell Signaling Technology, Inc.